One of the most interesting publications on New Zealand photography published by a local dealer gallery is Michael Graham-Stewart’s Crombie to Burton – Early New Zealand Photography. It was issued by the John Leech Gallery in Auckland during 2010 to accompany their exhibition of the same title. If your library does not hold a copy, it can be obtained via the following ISBN: 9780473165390. John Gow, Director of the Leech’s kindly gave me access to one of the photographs that Michael discovered to include in my presentation named How to Read a Rugby Photograph at the Pecha Kucha event held at Auckland Art Gallery last week. 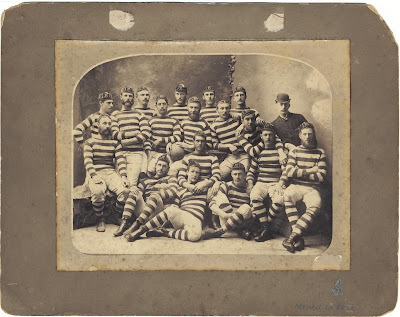 I told all the Pecha Kucha attendees that this was one of the earliest group photographs of an Auckland rugby team. It is also one of the rarest rugby images. Wrigglesworth and Binns was a Wellington photography studio, so it is likely that this portrait was made on the Auckland representative team’s visit there to play against the local team in what later became known as a famously disputed match. In terms of 'reading' a rugby photograph, look at how casual and relaxed the Auckland team looks. This was a shot taken for the team members themselves. Few better shots exist of a bonded group of players. soon to be released as hardcopy and ebook. Three cheers for the preps!